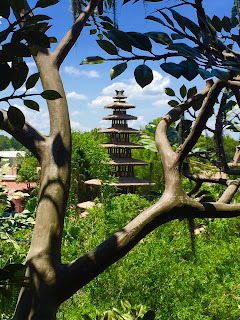 The Oasis is the part of Animal Kingdom that guests enter right after walking into the park. Most people just walk up the left or right pathways to head toward the Tree of Life. 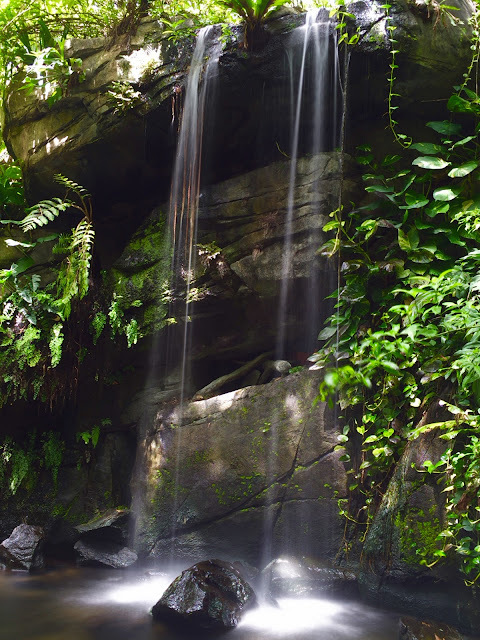 This beautiful waterfall isn't seen by too many guests, as you have to head to the center of The Oasis to see it. I took this shot using my long exposure app this afternoon. The Tune-In Lounge is a full service bar attached to the 50's Prime Time Cafe at Hollywood Studios. 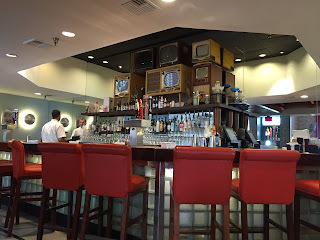 It is part of the waiting room for the restaurant, but it's also a great spot to come in for a drink. You can sit right at the bar or grab a cocktail to go. I took this shot today while giving a tour. I took this shot today, at the edge of the Rivers of America in Frontierland. At first glance, it looks like a basic photo of little significance. 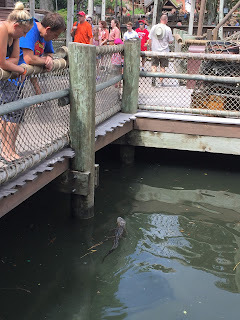 However, if you look closely, you can see a small alligator in the water. Although not common, these reptiles have been spotted here from time to time. Mickey's Philharmagic at the Magic Kingdom is one of the best 3D shows around. It had its first test run on this day (August 28th) back in 2003. I took this panorama of the mural in the queue a few days ago. In yesterday's article, I mentioned that a number of my photos have been included in a new book. 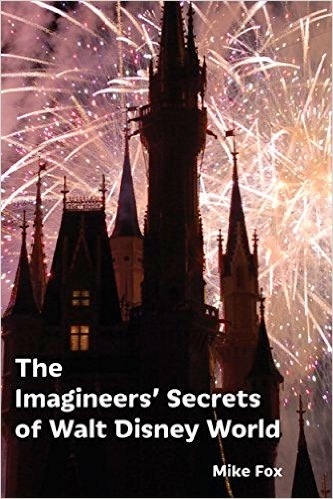 This book is called The Imagineers' Secrets of Walt Disney World. Written by Mike Fox, it is full of great details that are often overlooked by park guests. It has been a privilege to provide him with some of the shots he needed to complete this book. In addition, Mike has recently authored a Disneyland version. Prior to the books, he had created several informative and entertaining smartphone apps that are great park companions. 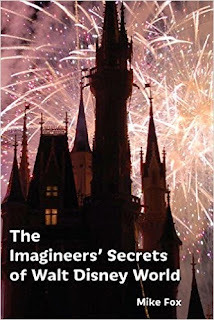 I highly encourage you to check out all of Mike's work over at http://www.disney-secrets.com/. The books are available in paperback and for the Amazon Kindle. Today marks the four year anniversary of my first "Digital Disney World Pic of the Day." On August 26, 2011, I posted a photo of the Magic Kingdom auto plaza entrance. Since that day, I've added a new picture nearly every day for the last four years. 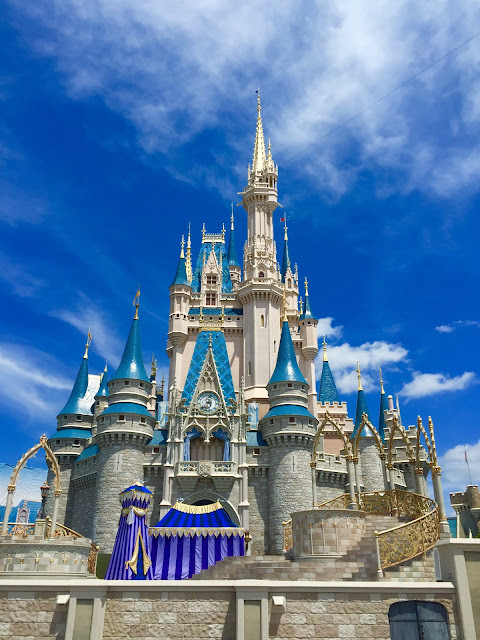 At the time, I was working at a job that I didn't like, and Digital Disney World was a way for me to stay connected to the magic on a daily basis. Less than a year after that first picture, I started WDW Guided Tours, and I've been fortunate to create a career doing what I love. The first year of pictures were almost entirely from Disney vacations. However, most of my shots since then were taken while giving tours at the parks. It is fun to look for things to photograph on any given day. Sometimes I have something in mind, and other times I just like how a random shot turns out. I want to say a huge thank you to everyone who continues to enjoy my daily pics. The photos have been viewed close to 200,000 times, and I'm grateful that people continue to check them out. Also, I've been lucky enough to have many of my shots published in a new book about Walt Disney World, which I will write more about soon. As I was waking through the Magic Kingdom today, I was looking for a good photo-op for tonight's anniversary pic. I decided that Cinderella Castle would be the most appropriate shot I could take. It is truly the iconic symbol of Walt Disney World. Here is a fun shot I took yesterday while riding the PeopleMover. The lights were on inside of Space Mountain as we rode through. You can even see cast members walking along the tracks overhead. The relatively new standby queue at Peter Pan's Flight is full of great details. Even though the line is always long, I still like to visit this queue on occasion. Today, I took this shot from "outside" the Darling residence. 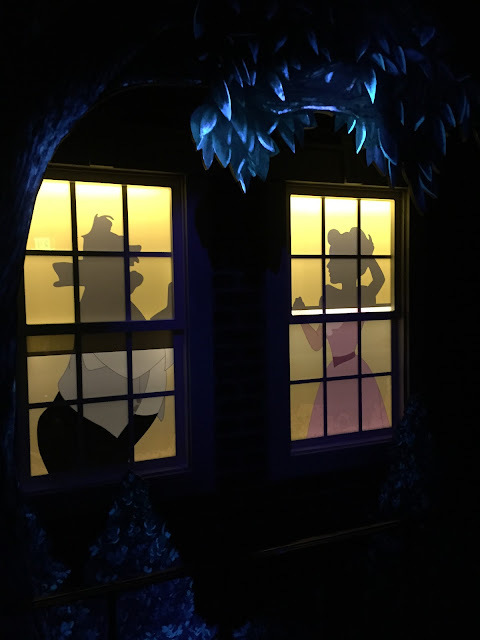 In sticking with the ride environment, the queue also places guests into a nighttime scene. This building, attached to the back of the mountain that houses Seven Dwarfs Mine Train, is the home to a Disney Vacation Club kiosk. It is also the home of several fun, hidden details. If you look closely at the sign, you'll see H. Goff Cartography. It refers to Disney Legend Harper Goff, who was the artist who designed the Nautilus from the movie 20,000 Leagues Under the Sea. This is significant because this building sits in the former spot of the 20,000 Leagues attraction. Another fun detail is the hidden Mickey above this sign, which is formed by the globe, sun, and moon. 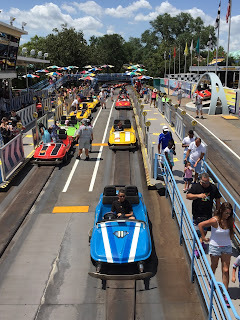 There are some attractions at the Magic Kingdom that are perfectly set up for taking photos of riders. Tomorrowland Speedway is one of the best. I normally stand on this footbridge to take overhead shots of my tour guests. 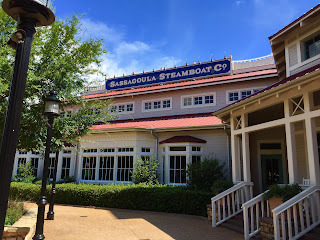 Today, I was over at Port Orleans Riverside for a short time. This resort is special to us, as it is where my wife and I stayed on our honeymoon. Back then it was called Dixie Landings. 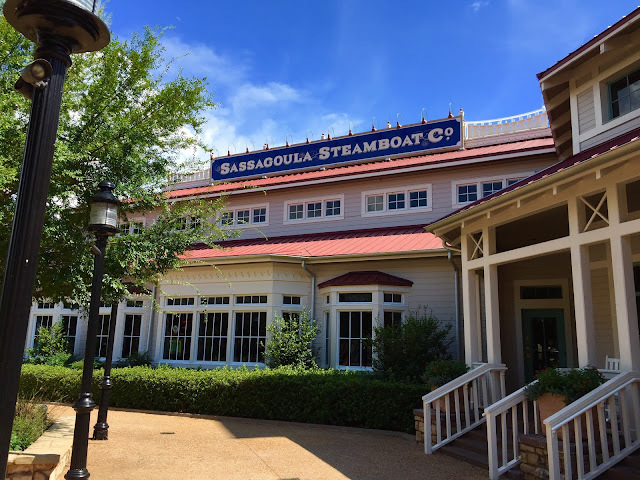 This shot is of the Sassagoula Steamboat Co., which is the building that contains the lobby. 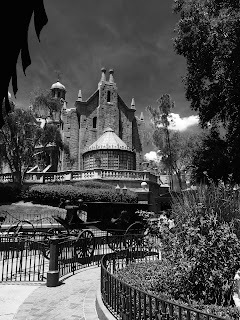 As many of you know, Haunted Mansion is my favorite attraction. I am always trying to find interesting photo opportunities when I visit. 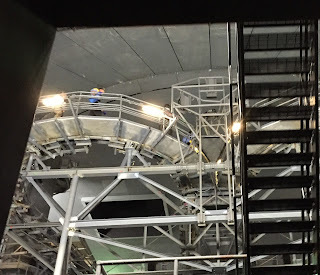 Last week, I took this shot from the FastPass queue. The black and white filter I used turned the bright blue sky into something more ominous. The Stave Church is the predominant icon of the Norway pavilion at Epcot. There is a very narrow walkway that goes around this building. I was standing on that walkway when I took this shot of the Viking statue, using the window to "frame" the photo. Walt Disney's Enchanted Tiki Room is an historically significant attraction. 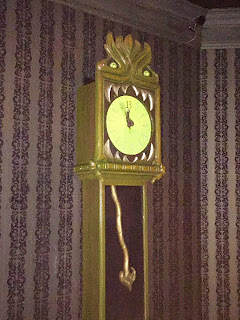 The Disneyland version contained the very first audio-animatronic figure. As I am always looking for unique angles for pictures in the parks, I took this shot from the top of the Swiss Family Treehouse. Dinosaur Gertie houses an ice cream stand in the Echo Lake section of Hollywood Studios. She comes from a 1914 animated short film. I took this photo a few weeks ago. I thought it would be fun to frame the shot with palm trees. 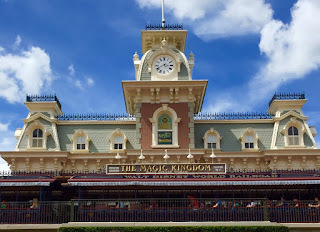 This is a shot of Main Street Station from the front of the Magic Kingdom. It is an iconic structure for several reasons. 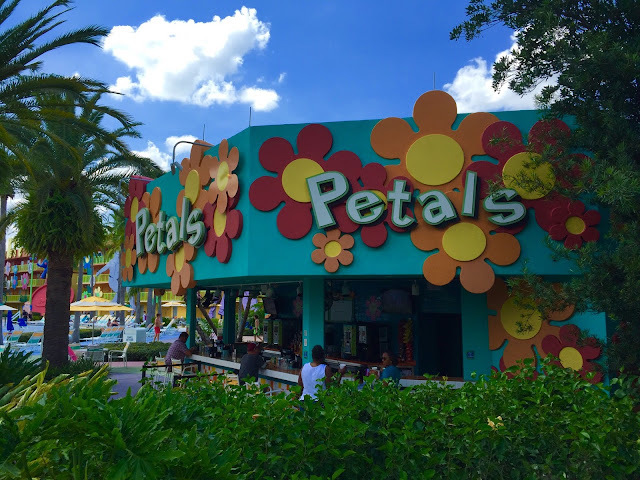 It is the first building that guests see as they enter the park. It is also the backdrop for the most photographed spot in the world. This picture was taken a few days ago. While walking near Casey's Corner a few days ago, I noticed an interesting character meet taking place. 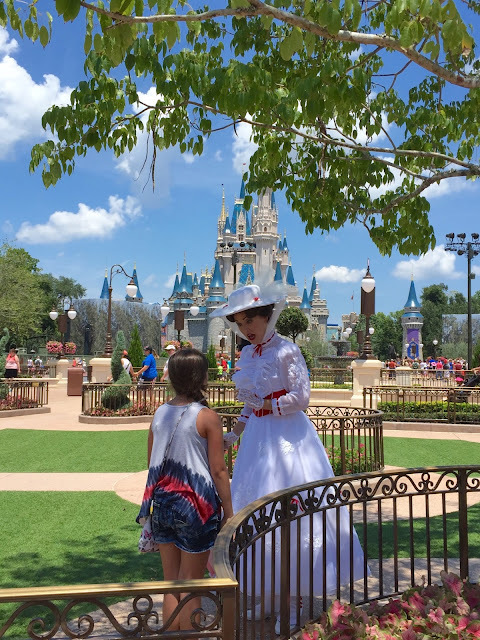 Mary Poppins was greeting guests in the new Plaza Gardens, standing in the Wishes FastPass area. She stood in the shade of a tree, and there was a great view of Cinderella Castle in the background. It will be interesting to see if Mary will be found here on a regular basis. Today, while enjoying the Haunted Mansion, our doom-buggy stopped momentarily. As I often do, I seized this opportunity to snap a picture. 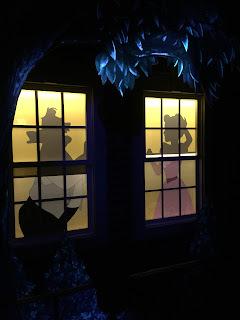 It is nearly impossible to get a good shot on a moving dark ride, due to the lack of light. However, when sitting still, it certainly helps. I thought my phone's flash was off, but apparently it was on "automatic." So, I embarrassingly illuminated this area of the ride. Since the picture came out good, I figured I'd post it. I don't normally post a photo of a photo, but I found this one very interesting. We visited the Orange County Regional History Center today, which naturally has a section devoted to Disney. 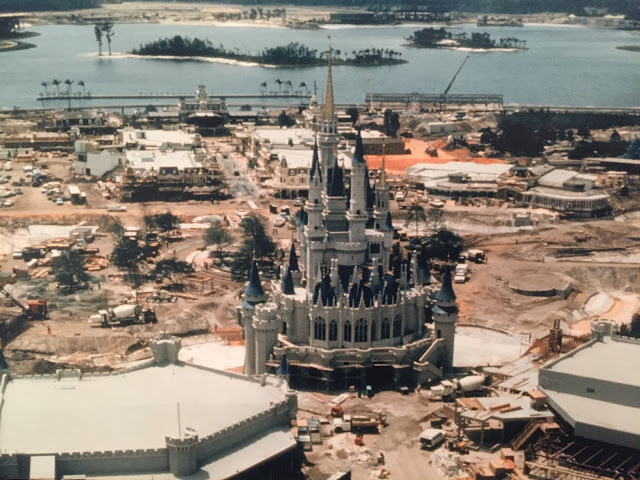 This shot shows the Magic Kingdom under construction from around 1969-1970. 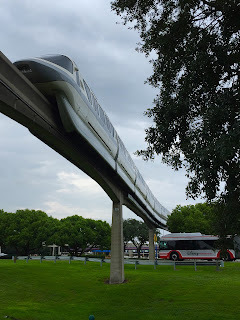 It is always fun to see unique images of Walt Disney World. There are many fun pool bars around the Walt Disney World Resort. Yesterday, I took this shot of the one at Pop Century. It is called Petals, to match the 60's "flower power" theme of that area of the resort. Today marks the one year anniversary of Robin Williams' death. It is still hard to believe that this comedy genius is no longer with us. As a tribute, I took this shot of The Magic Carpets of Aladdin today. 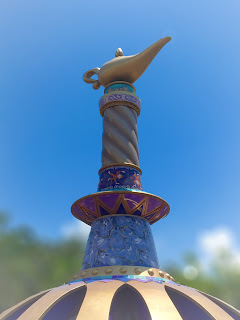 You can see the Genie at the center of the ride. 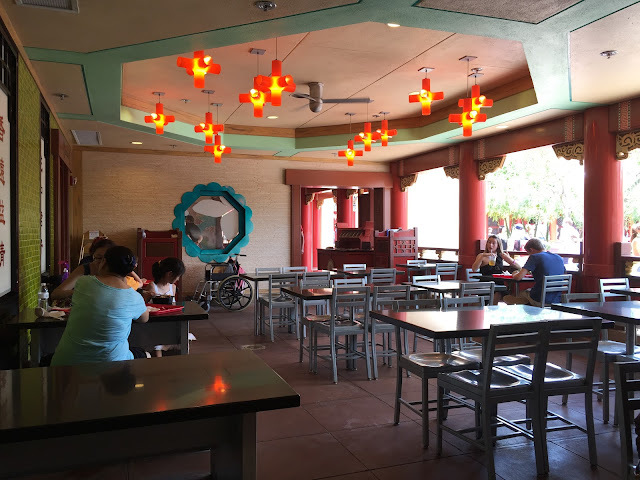 Continuing with yesterday's theme of World Showcase restaurants, we now head over to China. Nine Dragons is the featured spot in this country, but there is also a nearby, quick service location called the Lotus Blossom Cafe. I enjoyed having lunch here a few days ago. The San Angel Inn in Epcot's Mexico pavilion is one of the more unique dining spots in Walt Disney World. No matter what is happening outside, it is always night at this restaurant. 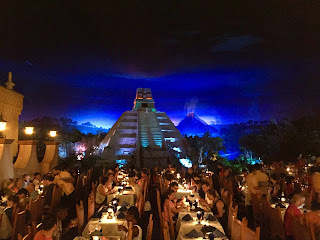 In addition, the river, Aztec pyramid, and volcano provide some amazing scenery. I took this shot the other day, while my tour guests were riding Gran Fiesta Tour. I have taken countless photos of Tower of Terror over the years. However, a few days ago, I took one of my more unique shots of this iconic attraction. 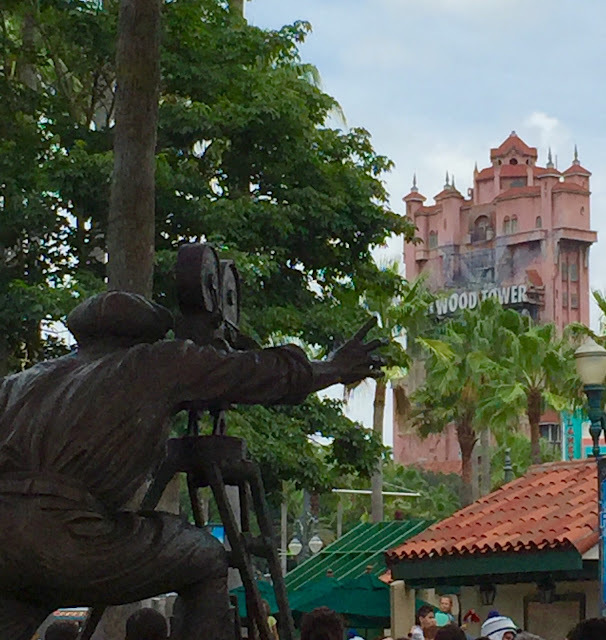 From this angle, it almost looks like the "cameraman" statue is pointing at the Tower of Terror. Since the statue was made the year after the attraction, I guess it is possible to think that he is filming the Tower. 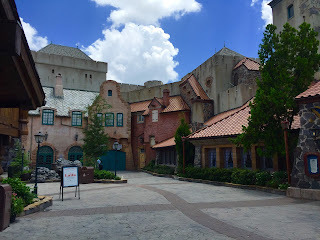 Although it was busy at Epcot on Wednesday, you can see how quiet Norway was. 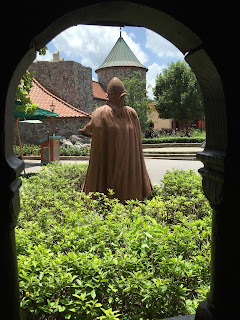 There were guests enjoying lunch at Akershus, and others in the gift shop across the way, but with the attraction under refurbishment, it is a quiet pavilion. 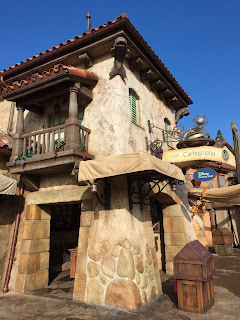 However, it will instantly become very popular again, as soon as the Frozen ride opens up next year! Ellen's Energy Adventure takes guests back in time through the age of the dinosaurs. 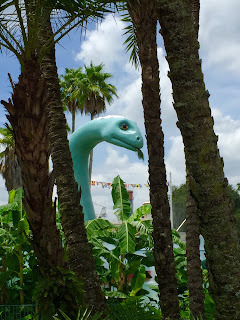 It isn't a thrilling ride like Dinosaur at Animal Kingdom, but it has some pretty realistic looking animatronics. 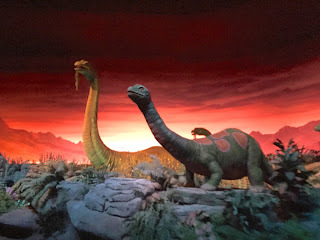 I took this shot today, while enjoying the attraction with our son. 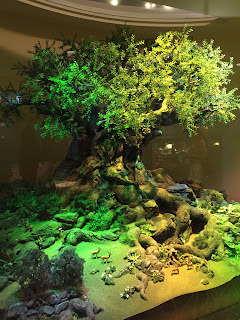 Yesterday marked the 20th anniversary of the "ground breaking" for Animal Kingdom. Construction started on Disney's largest theme park on August 4, 1995 and it opened nearly three years later on April 22, 1998. While giving a tour at Hollywood Studios yesterday, I headed over to One Man's Dream to take this picture. It is a large model of the Tree of Life, which is Animal Kingdom's park icon. There are very few places where you can capture the Empire State Building and the Golden Gate Bridge in the same photo. However, an empty Streets of America at Hollywood Studios provided for that opportunity this morning. I used the panorama setting on my iPhone to grab this shot of both the New York City and San Francisco streets. As I was walking to my car today, I snapped this shot at the Transportation and Ticket Center (TTC). Initially, I was just taking a monorail picture. However, upon closer inspection, I see that I captured three modes of Disney transportation. If you look closely, you can see the parking lot tram beyond the bus. 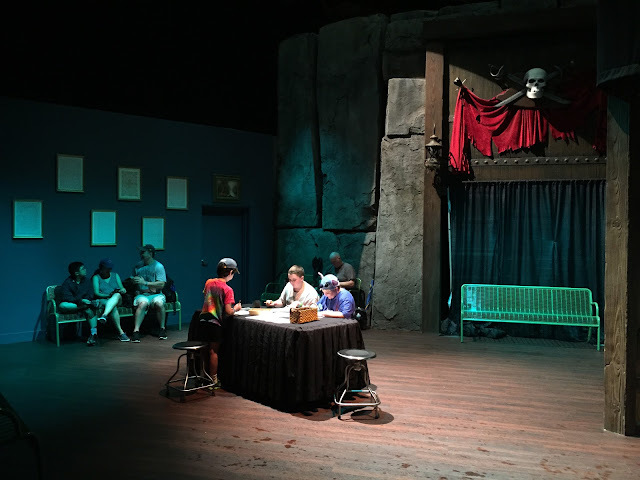 Disney recently opened an indoor spot at Hollywood Studios to take a break. It is called the Soundstage Lounge and is located in the lobby of the old Legend of Jack Sparrow attraction. There are a handful of benches and a table for kids to color Disney characters. It is a great place to cool off on a hot summer day. Today, I used it as shelter from a heavy Florida thunder storm. Today, we say happy 18th birthday to Coronado Springs Resort. It opened on August 1, 1997. This is one of my favorite Disney resorts for many reasons. First off, it is a great place to go for a walk. There is a pathway that takes you all the way around the lake at the center of the property. 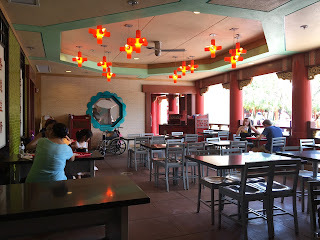 Secondly, it has one of the better food courts, especially if you like Mexican. Finally, there are great spots to relax. This photo, taken earlier this year, shows one of my favorite places to take a break. 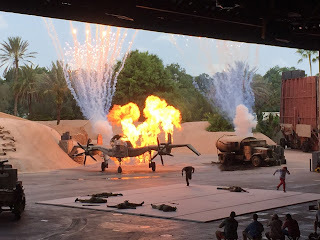 I have taken many pictures of the Indiana Jones Epic Stunt Spectacular over the years. This classic Hollywood Studios show has been entertaining guests for decades. Although it hasn't changed much, it is still very popular. My favorite photos to shoot are the final explosions in the finale. I took this one a few weeks ago.